Calera’s Bien Nacido wines are made from grapes grown off the famed Bien Nacido Vineyard known for its cool climate and coastal influence. 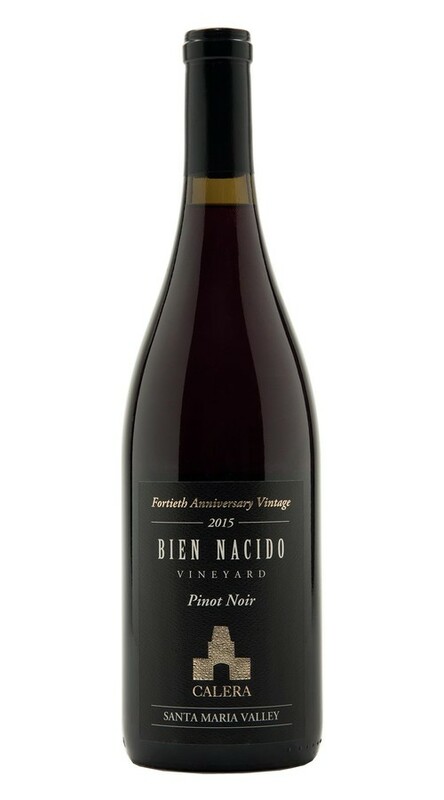 Our debut vintage of Bien Nacido Vineyard Pinot Noir opens with lovely bouquet of strawberry bramble supported by undertones of cherry cola. On the palate, flavors of blackberry, cherry and currant are met by hints of tobacco and all spice. This savory Pinot Noir is elegantly structured with a long, satisfying finish. The fourth year of a drought gave us very low yields across California, resulting in wines with great depth and concentration. 2015 was the earliest and fastest harvest ever for us here at Calera. The grapes were hand harvested, then whole-berry destemmed and fermented with native yeast in open-top fermenters. After fourteen days, the wines were pressed, settled overnight, and then moved by gravity to the barrel cellar. This wine was aged without racking in French oak barrels, 50% new, for 18 months.